The past fortnight has seen fractures starting to show in the relationship between Spotify and its biggest music industry suppliers. MBW is even told that Universal, Sony and Warner are considering the nuclear option of blocking Spotify’s global expansion into key territories like India by refusing market-specific licenses. One executive operating at the top end of the global market, however, is pretty sanguine about Spotify’s move – pleased, even. BMG CEO Hartwig Masuch tells MBW he’s been expecting this kind of thing for a while. And he’s happy to have the light shone on music biz economics which, he believes, favor his company. “It has been obvious for years that in a streaming world artists will demand, and artists will get, a bigger slice of pie,” he tells MBW. He added: “Spotify aren’t doing anything wrong as far as I can see, they are simply following the logic of the technology. 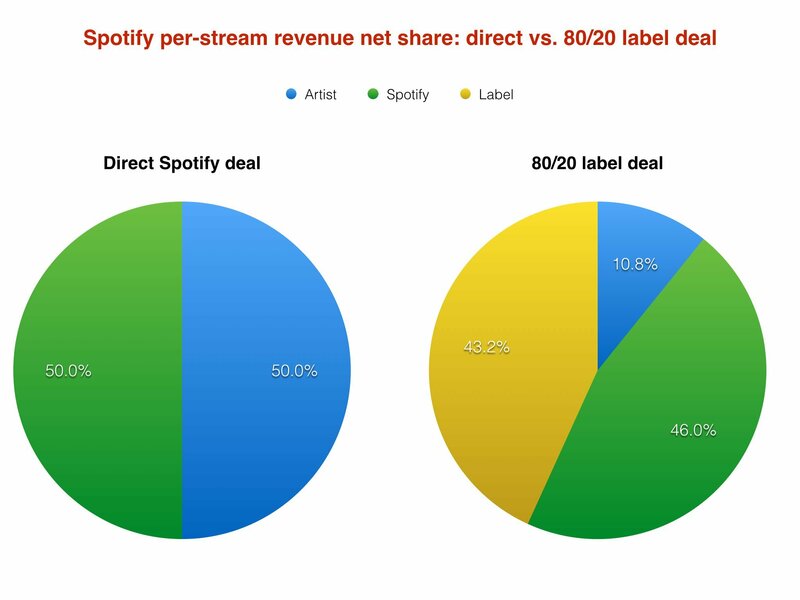 To understand Masuch’s relaxed point of view, it helps to closely examine the numbers..
As part of its new direct deals – which do not require any kind of platform exclusivity from acts – Spotify is reportedly offering artists a 50% per-stream share of revenue on its service. This is slightly lower than the 54% per-stream share which Billboard suggests is typically paid out to record labels. The crucial factor here is what happens to this money after Spotify has paid it out. If an artist is on a traditional royalty deal at a label – an increasing rarity these days – royalties would be roughly divided 80/20 in favour of the record company. In terms of a Spotify payout, this would leave an artist with 20% of a label’s 54% per-stream share: ie. a net share of 10.8% of the money. If an artist was on a JV deal with a label – a 50/50 split – they would get 50% of 54%: ie. a net share of 27%. And if act had signed a ‘straight’ distribution deal with a label – the no-frills option with no additional services – they would expect to keep around 85% of the money Spotify pays out: 85% of 54% is a net share of 45.9%. Obviously, a straight 50% payout from Spotify would potentially be more attractive for an artist than any of these headline numbers. However, signing a direct licensing deal with Spotify wouldn’t provide an artist with many of the key global (and multi-platform) support functions of a record company: things like marketing support, A&R, sync pitching, PR, radio promotion, physical distribution etc. BMG offers these functions to its recorded music signings but – typically – it does so alongside a deal which sees artists receive a 75% share of revenue, while 25% stays behind with the Bertelsmann-owned company. Assuming that Spotify is paying BMG the typical 54% per-stream label rate, this 75/25 deal would mean BMG’s artists are taking home 40.5% (ie. 75% of 54%) of Spotify’s total per-stream revenue, while still benefiting from a range of global label services. Masuch believes this offers a competitive challenge to Spotify’s attempts to ‘sign’ artists direct. Acts can take the 50% from a single streaming service, he reasons, or take 40.5% from BMG – which will promote their music on different formats, with different retailers, in multiple countries. “In principle going direct with digital services sounds like a great deal, but there is still significant time, resource and infrastructure required to manage and market a campaign across all the platforms. “In principle, going direct with digital services sounds like a great deal, but there is still significant time, resource and infrastructure required to manage and market a campaign across all the platforms,” he says. “It is not so much work that it justifies giving up 80% of your income as you would do on a traditional record deal. But we’re betting that most artists and managers will probably be prepared to pay for the service we can offer. BMG’s recordings business has recently enjoyed successes including Kylie Minogue’s Golden album (pictured) which was released in April and hit No.1 in Australia, Ireland and the UK. In March, BMG released Lil Dicky’s ‘Freaky Friday’, which has hit No.1 on iTunes in 38 countries and achieved BMG’s first No.1 on the Official UK Singles Chart.